Welcome to Christian Soldiers 7th Division! We are a Christian clan and a Protestant ministry that was started by a Christian gamer in May of 2011. We offer a family friendly environment for people of all ages and backgrounds to come together and enjoy playing their favourite online games. We believe and proclaim both old and new testaments to be the inspired, infallible, authoritative word of God and inerrant in the original writings. It is sufficient by itself for all matters of life and of God. We believe in one God in three parts. God the Father, God the Son, and God the Holy Spirit. We believe in the Deity of our Lord Jesus Christ, in His virgin birth, in His sinless life, His atoning death upon the cross, His bodily resurrection and His ascension to Heaven where He is seated at the right hand of the Father. When it comes to gaming we have hundreds of active players across a number of games. The games we choose to play vary from time to time. We started in 2011 with three dedicated servers playing Battlefield 3 and Call of Duty 4. Today, we have a number of clans playing all three major Wargaming titles and a number of other major online games. We offer the latest in gaming communications through Discord. It is a very high quality system that we use for in game chat as well as for bible study and prayer. All of this is free of charge as we don't require our members to give money but instead only rely on kindness of the heart donations from those who are in a position to give and be a blessing to us and others. You will find us to be a friendly bunch who just enjoy each others friendship, discipleship, and gamesmanship. Take some time and check us out. Enjoy your stay. Check out the list of games we currently play. Join up with us online and play a while. Do you have something you would like prayer for? We have a number of members who check the prayer request list regularly and are more than willing to pray for you. We offer a weekly online bible study lead by our dedicated pastor. Topics vary. Send us an email, check our website for news, or join us on our Discord server. Christian Soldiers, 7th Division is operated under the direction of the CS7 Council. 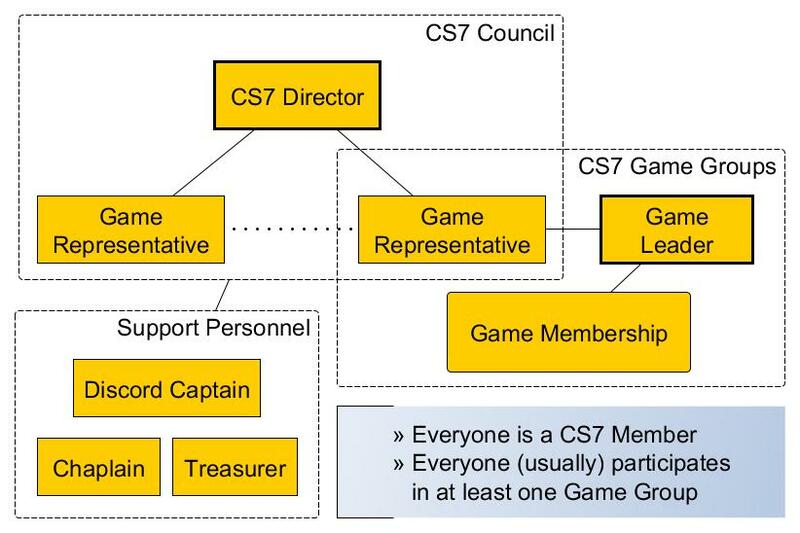 Each member game group runs semi-autonomously under the umbrella of the Council. With the help of our Support Personnel, CS7 enjoys fellowshipping with our members, friends, guests, and newcomers in-game, online, and in prayer. For more information on our organizational structure and our specific roles, click on the following image. Image shrunk - open in new tab/window for a larger view. Membership in CS7 gives you access to all of our Game Groups which include all our Core, Mobile and Dedicated Server games. We have public access to our Discord server at various levels. We have decided to make Discord membership a requirement for all members. This has benefits which include being able to attend our quarterly open meetings (the first Thursday of Jan, Apr, Jul, Oct, 9pm Eastern), see clan wide announcements, and it's also just a good place to check in. Many of our game groups require Discord for (semi)competitive play. The first step is to apply to CS7 using our web form. After your membership is approved then you become a member of the CS7 Ministry community and are free to join as many or few Game Groups as you like. Please note that it is up to each Game Commander as to how they set the admission requirements for each clan in each game, and it is up to the Game Group leadership to accept your in-game application. After being accepted in-game you will be given access on our Discord server to the appropriate game groups. I have been a fulltime Pastor for nearly 30 years. I play a few computer games to relax, have some fun, and just decompress from the worries of the day. I have only been a member of CS7 for a short time, however I cannot express what a great group this is! I have found them genuinely concerned for others, willing to pray for one another, to check in on someone who they have missed, and to go out of their way to welcome new members into their Christian family. Yes, Christian family! Our Discord Server is far different from any I have ever experienced. Not only do we have gaming specific channels, but there are dedicated channels for prayer request, Bible study, church services, and just general chats. What is so good about these is that they are actually used! My wife was going to have some major foot surgery, so I added her to the prayer request channel and within a short time several had responded letting me know they would be praying. Not only that, but when I was in game voice they were asking about her. I am so thankful that God let me find such a great online community of Christian people who play games and live out their faith. I joined CS7 2016 because I am a Christian and this is a Christian clan without a doubt, I was here for about a year and I left CS7 and went to another clan that was military based with a lot of vets. and active military, The ridicule because I am a Christian and the language was so bad that I could not tolerate it, so in July of 2018 I asked to come back to CS7 and they took me back in with open arms, The love and support of CS7 is incredible, God bless you all.